Mary records new version of 'Those Were The Days'. It's been 50 years since Mary shot to number one with 'Those Were The Days'. We're delighted to announce that she has celebrated this with a new, stripped-bare version of this iconic song. Read how it happened here. 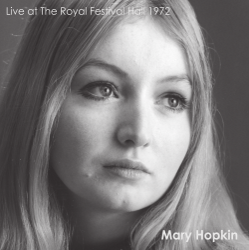 To reminisce about Mary's earlier career check out our Mary Hopkin Friendly Society section. Read about the 1977 re-recording of 'Those Were The Days' and 'Goodbye' here. To stay tuned to what Mary is doing these days, read on and browse the site. 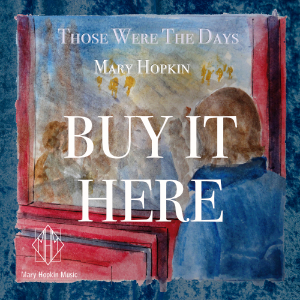 Twitter: @themaryhopkin - Mary herself, so you can have a chat. Facebook: Facebook.com/maryhopkin - run by Jessica. Our Space Records Store incorporates all of Mary's releases on Mary Hopkin Music as well as music from her offspring, Morgan Visconti and Jessica Lee Morgan, and books from her mother Elizabeth Morgan and sister Carole Morgan Hopkin. Copyright (c) Mary Hopkin Music 2007-2018. All rights reserved. No use may be made of any content without the permission of the owner.